When you are actually in a survival situation, you will need weapons for defending your family and for providing fresh food. There are fiscal and physical limits to how much you can make or buy and store. Even if you have enough provisions to survive the first year, how will you get through the next, and subsequent years? Obviously, the answer is to supplement and replace your food storage by planting a Survival Garden and hunting for fresh meat. At first, game will be relatively easy to spot and the stopping power of your ammunition will be key to your success. As time passes and game becomes more difficult to find, you will increasingly rely on the skills you had learned earlier and the long-range accuracy of your rifles. After you have “dropped” a game animal, you may find yourself having to defend your prize from others, who will attempt to take it from you. These will be hard times and desperate people will need to be shown that you are able, and by your attitude that you are willing, to protect that which is yours. Your stockpile of food and other survival gear will make you subject to attacks from bands of marauders who may well be neighbors who had refused to see or act upon that which was so clearly obvious to you. These people will at first approach you as friends, seeking your help and asking for food for their families. If you help them a little, they will come back for more, forcing you to choose between feeding their families or your own. They will become resentful and enraged by your refusal of further assistance and they will conspire with others to take what they need. Your best defense against such attacks is the alliance formed with like-minded, trusted and reliable neighbors. If you are going to have only one gun, make it a semi-automatic or pump action 12-gauge shotgun. Imposing, persuasive and effective for hunting and defense as a 12 gauge can be, it is not by itself a survival arsenal. A hunting rife, caliber .308 Winchester, with a telescopic sight. A semi-automatic rifle, caliber .308 Winchester (7.62mm NATO), with telescopic sight. A semi-automatic or pump action 12 or 20-gauge shotgun. A handgun of substantial caliber for every adult. A semi-automatic carbine, caliber .223 Remington, (5.56mm NATO), with a red dot sight. A bolt action or semi-automatic small game rifle, caliber .22LR with telescopic sight. Plentiful, ample and lots of ammunition for practice, training, hunting and actual defense, for each weapon. A crossbow, 150 to 180+ lb draw and dozens of bolts (arrows). Now, if you do not already know: LEARN HOW TO KEEP, STORE AND USE YOUR GUNS SAFELY!!! More important than simply having any gun is KNOWING HOW TO USE IT. It makes no difference what you have in your hands, if you miss the target. You never need a gun until you need it, and then you better be sure that you have the right gun and that you know how, and are willing, to use it. As a gift this past Christmas, I received a book on reloading. I’ve never reloaded my own brass before and I’m looking forward to it. I hope it will prove more cost effective and provide a better, long term solution to storing ammunition. I like the points brought up here, it’s clear you’ve done your research and have been at this for a minute. There are so many articles about prepping and what you should and shouldn’t need.. it’s hard to know what to trust or where to start. I’m liking this because I can tell you’re serious about this lifestyle. The only other place I’ve found online that I’ve liked like that has been TopDogPreppers.com but they’re more product-based. 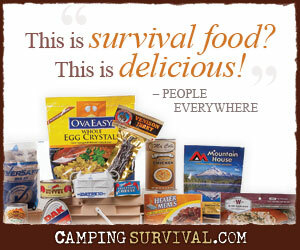 I like them because they’re owned and run by a family of preppers so I trust their opinions, like yours. Hopefully by the end of the year I’ll have a good list of resources so I can get started next month: it’s my new year’s resolution to finally complete our family’s disaster plan.